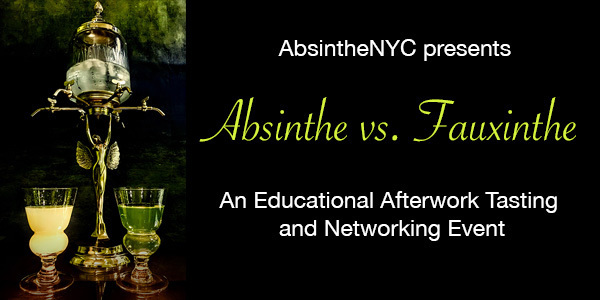 Absinthe NYC is hosting their 2nd Absinthe tasting event in New York City. This is Part 2 in the series. Absinthe Vs Fauxinthe. This event will cover the difference of quality absinthe vs imitation absinthe. Unfortunately imitation absinthe is still widely produced. It is highly important to know what you are drinking. This is an interactive tasting with history presentation, discussions and preparations in classic, traditional and modern methods. We will be drinking quality absinthe and sampling some of what is "thought to be absinthe" and understanding the quality and characteristics to better educate the beginner and the connoisseur absinthe drinker and help refine their palate. We are very happy to announce that Swiss master distiller Patrick Grand will be sponsoring our event and be present with his 1st place Absinthes winner 2 years in a row at the Absinthe competition in France. this is a special event you do not want to miss!